Indestructible Dog Toys for Power Chewers. 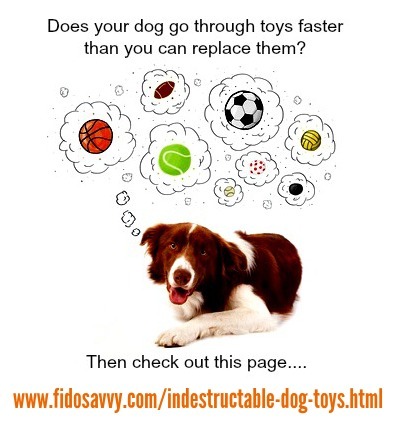 Indestructible dog toys keep your puppy or dog happy for longer and can save you money and stress. Safe, sturdy and strong dog toys are a necessity because a bored dog can be a destructive dog... and the bigger he is, the more trouble you're going to be in! But it's not only the big guys who can do some damage. Smaller, high energy breeds such as terriers, and herding dogs can also wreak some havoc of their own, and they can all destroy your 'average' dog toy in short order. As 'mom' to both Rottweilers and Italian Mastiffs, I can tell you that the majority of dog toys are NOT designed for these kind of power chewers. This page has info. to help you choose toys which will 'go the distance' as well as a great selection of the very toughest dog toys on the market. This is where personal experience has paid off and I know how to recognize a tough dog toy. If your pup is a large breed, or has especially powerful jaws (like a APBT or Boxer, for example), then it's important to stay away from the cheaper plastic, rubber or soft toys. None of these will stand up to Fido's dedicated chewing. Sadly, I would also have to say that I rarely find soft (plush or canvas) toys that makes the 'indestructable dog toys' list! My dogs adore these toys, but even the best of them will have a limited 'shelf life' compared to other types of super-tough dog toys. Loads of dog toys look strong and sturdy, and many are marketed as 'chew toys', but the majority will not survive any serious chewing on Fido's part. Some companies are known for manufacturing super durable, safe dog toys which are designed for aggressive chewers. Of course there are other companies which make tough dog toys, but these are the ones which are well known for the quality of their products. 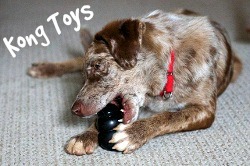 The material/s a dog toy is constructed from, and how it's put together are very important when it comes to durability. Toys made from cheap, generic rubber tear easily. Hard plastic toys can be broken or splintered. Soft toys which are made from non-durable fabrics with single sewn seams will be torn apart by a power chewer in seconds. So.. what are indestructible dog toys made from, and how are they put together? With soft toys look for several layers of stitched seams and multiple layers of extra-strong fabrics (preferably with chew-shield plastic or laminate between layers). Toys that are stuffingless are safer and less messy. Squeakers should work even when punctured and be firmly embedded in the toy. If the dog toy you're considering isn't from a recognizable brand like those listed, be wary and do your homework before purchasing. When you're trying to choose indestructible dog toys, size really does matter. It's a situation where bigger is always better. It's pretty easy to get toys which are relatively big for small dogs, not always so easy for the big 'uns... and they're the ones who usually need the toughest playthings. My rule of thumb is 'if in doubt get the next size up'. It's stood me in good stead for decades. 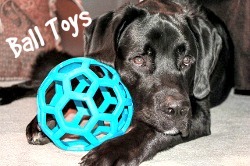 The toys featured on this page are the very toughest, most durable dog toys on the market. 'Indestructible' is a relative term when applied to dog toys in general and obviously it's possible for a dog to destroy even the strongest toy available. Most of the dog toys below will provide exceptional play value and last much longer than generic, poor quality toys. They're also safer for Fido. The 'weak link' are the soft toys. Although only the very toughest soft toys designed for dogs are included, most power chewers will be able to tear them given time. They will still be longer-lasting than your average plush or fleece toy, but are not invincible. One of the most famous names in indestructible dog toys is Kong. The original, heavy-duty rubber Kong Toys have been around since the 1970's and are the original tough dog toy designed to stand up to the company founder's German Shepherd. They're SO good that they're still market leaders today! Of course there's a much wider variety of Kong toys available today. There's a whole host of sizes, shapes and colors to choose from, and it's difficult to find something more entertaining to your dog than an original style rubber Kong stuffed with peanut butter and frozen for a few hours. Now THAT's a tough dog toy! The product line now also includes 'soft' toys of different descriptions, these aren't as sturdy as the rubber toys, but they're still superior in terms of standing up to wear and tear, than most similar designs. ... you know, those dogs that destroy every toy known to man in under an hour! Can be stuffed with food or treats. Also has an unpredictable bounce for added play value. Sizes: Small 3" - Medium 3.5" - Large 4" - XLarge 5" - XXLarge 6"
Made from the same extra-durable Ultra-Flex™ rubber, the Kong Extreme Goodie Bone isn't just super strong. It can hold Kong Stuff'N, peanut butter, Kong Stuff'N Snacks or a suitable treat of your choice in each end of the bone for extra play value. Helps curb destructive chewing and is great for dogs who suffer from seperation anxiety. Sizes: Medium 7" - Large 8.5"
Made from the original red high strength plastic polymer, the Kong Wobbler is a strong, durable chew toy with a fun treat dispenser built right in. Interactive toys are great for keeping dogs occupied, and this one has the added benefit of being 'Kong tough', a winning combination. Easy to fill, dishwasher safe. Sizes: Small 6" - Large 10.5"
While not as long-lasting as the purely rubber Kong toys, the Kong Wubba can still hold it's own and provide tons of playtime fun. An interactive tug-and-toss toy is made from two balls (a tennis ball and a squeaker ball) covered in extra-tough, heavy duty nylon fabric. Dogs love to pull and chew on the long legs/tentacles and the fabric can handle a lot of chewing! It's also easy to throw and less messy to get out of your dog's mouth than your average ball. ** The 'Wet Wubba' is not as durable or chew-resistant as this original version. The Kong Wild Antler Rope combines two of my dogs favorite toys... rope and natural antlers. It's a winning combo for sure. Uses naturally shed, Grade A wild Elk antlers and sturdy rope. A very satisfying toy for aggressive or power chewers. ** You can also buy a Kong Wild Elk Antlers, without the rope. Natural, satisfying chew toys for all dogs. Just about every dog loves to play with a ball, whether it's a soccer ball, a tennis ball or a squeaky ball... they're all hot favorites. BUT finding a ball that can go the distance with a power chewer is a challenge. Some of the balls that dogs love most can even downright dangerous for them (regular tennis balls or small hard plastic/rubber balls included). My dogs are pretty average in this respect (but of course they're above average in cuteness, intelligence and just about everything else loll) and they love balls just like all their friends. This Hol-ee Roller X Extreme Ball is awesome, and it's probably one of the most versatile balls ever! Made from 100% all-natural rubber, it's 'squishy', stretchy and stands up to a huge amount of abuse. We have several of these in our house and every dog loves them. Because the Hol-ee Roller is so flexible, your pooch can't really get a good 'grip' on it, and the unexpectedness of this is half the fun! The Chuckit! Ultra ball is a little nugget of gold when it comes to ball dog toys. Surprisingly durable, with an extra-thick rubber core, this ball is super bouncy and floats too. Designed to be used with the corresponding Chuckit! Launcher for endless games of fetch. Bright colors make this ball easy to find when Fido refuses to bring it back (or maybe it's just my dogs who do that!). Both balls and launchers are available in a variety of sizes, so there's one to suit every dog. ** The Chuckit! Ultra and Ultra Squeaker balls are the most durable. The original Orbee-Tuff Orbee Ball is made from a proprietary award-winning compound and has been called 'the worlds best dog ball'. It's an extremely durable, fun dog toy.. bouncy, floaty and minty tasting. Irresistible to dogs and perfect for a game of fetch. Planet Dog make a whole host of tough dog balls and toys which come in a variety of shapes, sizes and designs. Originally made for horses to play with there is now a range of Jolly Balls designed especially for dogs. The Jolly Pet's Romp 'N Roll Ball is constructed from heavy-duty, non-toxic Polythene plastic which can take a LOT of abuse and the ball won't deflate even if punctured. It's threaded onto sturdy rope so that it can easily be tossed, tugged, thrown and carried. One of our Rottweilers adored this, next to his bowling ball it was his favorite! These Jolly Pets Ball are available in a variety of sizes (4.5", 6" and 8"), as well as different colors and designs. The Jolly Pets Tug 'N Toss is made from the same super-tough material and has a molded handle. It's perfect for the biggest dogs and floats too. The Jive Zogoflex ball just might be the closest thing you'll ever find to an indestructible dog toy! Made from West Paw's proprietary Zogoflex material which is super-strong, bouncy, BPA-and-Phthalate-free and totally recyclable,. This is a ball which truly doubles as a chew toy. 100% guaranteed by manufacturer against damage. Available in bright fun colors and three sizes: 2", 2.6" and 3.25"
Other fun, guaranteed tough Zogoflex dog toys include the Hurley, the Tux and the Bumi (to name but a few). Indestructible dog toys come in all sorts of shapes, sizes, colors and designs. The tough dog toys featured next are a selection of the ones I think are superior and the majority of them have been tried-and-tested by our multi dog household. Nylabone Big Chews for Big Dogs are a designed specifically for power chewers. Made from extra-tough nylon, and oversized, they're especially suited for dogs over 50lbs... but medium sized aggressive chewers love them too. We always have several of these in the house and although there are definitely teeth-marks on them (and some areas can get scraped down by eager teeth), they holding up fanatastically well. Plain nylon can be boring, but these bones are flavored (choose from chicken or turkey) which makes all the difference. 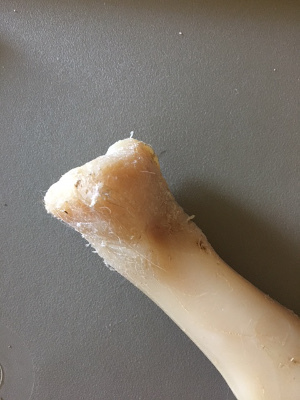 Here's a look at the damage my power chewers were able to inflict on a Nylabone Big Chew flavored bone. This is over six months worth of happy chewing. You can see where the nylon has been shaved off by my dog's teeth, but I feel comfortable that there is not enough being ingested to be worried about. The safe fun they have (not to mention the wonderful doggie stress relief that comes from chomping down on a sturdy chew toy) is totally worth it. The Nylabone Antler is a new kid on the block and is an alternative to natural antlers (which also make this indestructible dog toys list and my dogs love). Made from super-tough nylon which has minerals and calcium built right in, this provides Fido with clean, healthy, long-lasting chew appeal. Added venison flavor makes it a win-win. Also available is the bacon flavored Hoof Bone made from the same mineral and calcium enriched nylon. Personally I hate real hooves, bully sticks and pig ears because they're so smelly so this alternative is good news for me. Fido's beef-flavored Extra Tuff Bowser is made from super-tough polyurethane and has a tasty beef-stew flavored built right in. Designed to be truly indestructible, this dog chew toy is guaranteed by the manufacturer for three months. Also in this range is the Fido Super-Flex Chicken Bone. It's unique blend of tough polyurethane and synthetic rubber gives it bendy flexibility. Not as durable as the Bowser, but a good choice for moderate chewers. Antlers are totally natural chews that all dogs love, and they are incredibly durable. 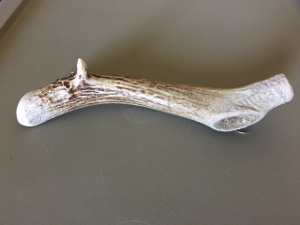 This 100% natural Jumbo Deer Antler from WhiteTail Naturals is a premium product and perfect for keeping aggressive chewers busy and happy. A healthy, natural source of minerals. The rough surface helps to minimize tartar build up too. Made in the USA. Hand selected, washed, no added preservatives or chemicals. 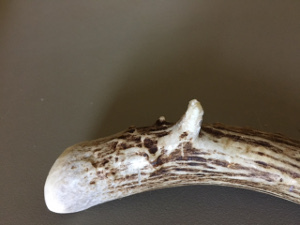 Here's a look at a deer antler that has been well loved, and happily chewed on for a period of about six months. You can see how the edges and 'nub' are worn down, but the antler hasn't splintered, cracked or broken. My dogs antlers so much that we have several for them to share. The added benefit of these sturdy dog chew toys are that any of the antler which is scraped off and ingested is actually beneficial as it contains trace minerals which are good for your dog. These natural Peanut Butter Filled bones are a tasty treat for dogs and they're very long-lasting. 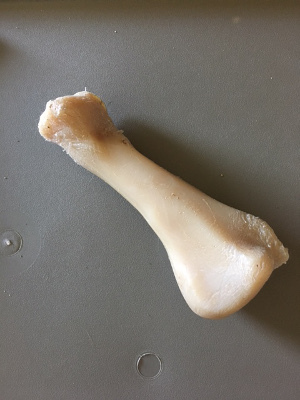 Fido will manage to get the filling out after a while, but the natural femur bones themselves can go the distance. I tend to let my dogs play with these for only an hour or so at a time until all the filling is gone. Otherwise they will keep going until it's been completely devoured. This category of indestructible dog toys features a selection of sturdy toys which can give your aggressive chewer hours of fun... but which are not necessarily as super-tough as the Kongs, balls and bones listed above. As I pointed out towards the top of this page, soft toys simply aren't as durable as many other types of dog toys... sad, because so many big dogs LOVE them. 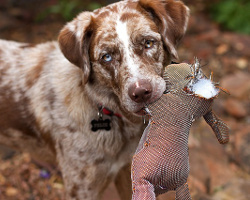 Here are the last few tough dog toys that I feel deserve to be on this page and will be thoroughly enjoyed by your dog. The Bionic Bone is just one of a range of chewy, bouncy, floaty dog chew toys from Outward Hound. A combination of the proprietary 'Bionic' rubber material and the unique interior shape of this toy makes it able to stand up to some serious chewing. Designed with an opening in each end which can hold treats for added interest. Available in three different sizes: Small 3.5", Medium 4.5", Large 5.5"
This Goughnuts Power Chew Ring is a virtually indestructible dog toy. Designed by engineers and composed of several layers of proprietary rubber compound. The outer layer is either orange/yellow/green or black and the inner layer is red. The black Maxx Goughnuts (like the one featured) contain engineered carbon reinforcement for added durability. IF your dog manages to chew through the outer layer and reach the 'red means stop!' layer, you can return the toy under the company's 'Lifetime Guarantee' and get a free replacement. Recyclable, floaty GoughNuts come in a wide variety of shapes and sizes including the Maxx Stick and the interactive Maxx TuG, the Original Goughnuts Ring, the regular interactive TuG and more. 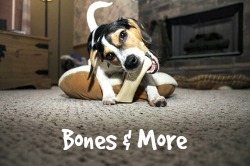 The WO Bone is a safe, super-tough, made-in-the-USA dog toy that Fido will love. The unique rubber composition is BPA and Phthalate free, completely non-toxic and FDA approved. With it's twisty design, erratic bounce, floatability and satisfyingly chewy texture, the WO Bone could just be your dog's new favorite toy. Available in Small or Large sizes and four color options. *An added bonus is that every WO bone sold provides two meals for a child in Ethiopia - thanks to the manufacturer's partnership with Bring Love In. The new PetQuerks Flavorit nylon bone has a unique concave shape and is designed specifically for aggressive chewers up to 50lbs in size. Made in the USA, these bones are infused with tiny 'flavor cells' which make them super tasty. Available in a variety of flavors and three different sizes, there's bound to be one that's perfect for your dog. In addition to their allergen-free Peanut Butter flavor (featured on the left) you can choose from Mint (Chlorphyll infused), Bacon, Berry, Sweet Potato and more. Outward Hounds' Fire Biterz Lizard is a tough little critter that your dog will love. Made from multiple layers of tightly woven, rubber coated, super durable material (the same kind used for firehoses). Stuffingless design limits the eventual clean up for you, and the heavy-duty squeakers which keep squeaking even after being punctured keep Fido happy for longer. HuggleHound's Knotties Raccoon dog toy belongs to another range of soft dog toys which stand a chance of not being destroyed almost immediately. Made from several layers or fabric and using HuggleHounds' patent-pending Tuffut Technology process for extra durability. No external seams, machine washable. Outward Hounds' Invincibles Plush Snake is one tough guy. He's made from two layers of super-tough fabric including the Dura-Tuff lining, reinforced double seams and squeakers that keep squeaking long after they've been punctured. No stuffing which means less mess for you to clean up when he does eventually succumb to your dog's efforts to tear him limb from limb (well, snakes don't have limbs but you know what I mean). There are other super-tough critters in the Invincibles range including a Gecko and a Frog. I'm sure that this list of indestructible dog toys has at least one, hopefully several, tough toys that will work for your power chewer. If you have any tried-and-tested super tough toys you'd like to recommend or comment on these, or any other dog toys for aggressive chewers please use the Facebook commenting below. Thank you!